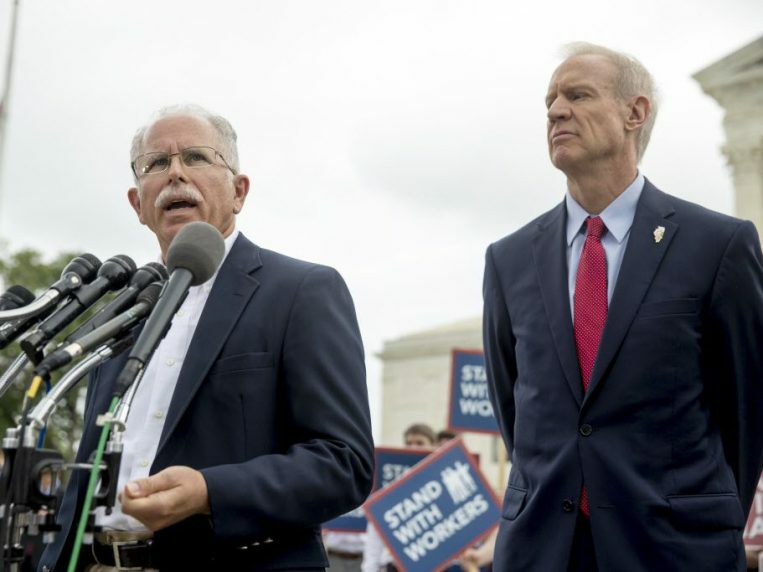 Mark Janus, who lent his name to the anti-union lawsuit to screw American working people, has scored a really cool gig with a right-wing think tank. This should be a lesson to us all. It really pays to be the first one to sell out your brothers and sisters nationwide. You collect your union-negotiated retirement benefits, get some cool job sitting around an office somewhere, and you don't really have to do anything ever again. Was this a deal he made in advance? I don't see why not. So Janus has really paid off for Janus. It's only the rest of us who will suffer. You see, if you actually study history, you find that Americans do better when they are unionized, not occasionally, not sometimes, but always. You find that unionized workers make more money than non-unionized workers, and you find that non-unionized workers make more money too when union flourishes. You will also find that union has been rolled back since Reagan was President. This is part of a concerted anti-union program in the United States and it's sorely reduced the number of unionized workers. Now when government boasts of job creation it's often as not jobs that pay minimum wage and come without health insurance or any benefits whatsoever. In fact, many crappy fast food jobs make you sign disclaimers that you won't jump ship for other crappy fast food jobs. This removes the possibility of the competition that Republicans argue will improve the economy. We are a selfish country, and we choose to be that way even when we are screwing ourselves. We have a national news network that caters to the needs of the uber-rich. It's somehow managed to persuade a great swath of the country that they too might be uber-rich one of these days, and that they therefore must support rules that expand the rights of the uber-rich. Of course, that's not the only way you manipulate the public. You manage them through racism and xenophobia. You make them terrified of Muslims. You make a big thing out of not allowing them entrance to the United States, unless they come from countries with which you do business, in which case they're fine. You then ignore all terrorist acts committed by white people, because if you demonize white people there goes your base. How are we gonna Make America Great Again if we contend the characters on Leave It to Beaver were terrorists? It isn't easy to get people to act against their self-interest. Fox couldn't exist, for example, if American hadn't done away with The Fairness Doctrine, which required broadcasters to present both sides of an issue, rather than simply spout right-wing propaganda. But we're way down that road now, and it will take a sea change to turn back. Janus contended he had to leave his First Amendment rights at the door when he went to work. In reality, unions have separate political funds. I contribute to one. Even though I sometimes disagree with UFT endorsements, I want union to be able to fight things like the Constitutional Convention. Now that we're in an actual existential crisis, I want union to be able to fight even more. What Janus contended was that union itself was inherently political. Thus, the Americans who wanted to fight for more work for less pay were never well-represented when they were compelled to pay union dues. It's kind of ironic that Janus, as soon as the Koch Brothers finished using him so they could keep money they'd otherwise have to give working people, gave him a gig for less work and more pay. Of course, hypocrites will do things like that. They'll take more money for themselves while screwing everyone else. And now every American in a union will be able to follow in Janus's footsteps. They can withhold their union dues while making saps like me cover their expenses. The only problem is, in the long run, they won't benefit like Janus did. The less power union has, the worse working conditions will become for most Americans, Most Americans will actually lose more than the relative drop in the bucket represented by union dues. And make no mistake, that's why billionaire Bruce Rainer started the lawsuit, that's why he set up a stooge named Janus, and that's why the Koch Brothers and Walmart bankrolled it. They want a Fox News-watching, self-screwing country of ignoramuses.